Correction: the data sheet says AH7373 (IA) Equinox, Inc. is in Idaho (ID) not Iowa (IA). True. Also, I was dyslexic with the Air Force marker; it should be AE4289, not AE2489. I have a short list of corrections for the web page, a few in data and most in formatting. Between all of the submissions I estimate the list is going to be about 550 agencies/types of disks (probably 440 different agencies) by the time I'm through the spreadsheets. There will be 150 or so that don't have photos yet, some of which have been logged on Geocaching. We couldn't find a PID# for this one, but had to at least post a picture so you could see the "Name" of the setting agency. Found east of Tucson, AZ. I have better photos for about 15 agencies, and corrections to another 15 or so. I've found a number of agencies that didn't previously have photos, but the list of non-photoed disks has expanded significantly. I'll be reorganizing things soon. 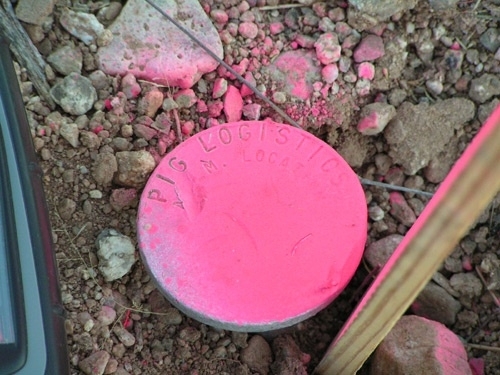 AE4743 (UT) Salt Lake City Corp.
AB5000 (WA) Datum Pacific, Inc. Here's the additions to the new agency, no photo list. In some cases the listed PID is the only PID for that agency that I could find; others below have many PIDs for that agency. 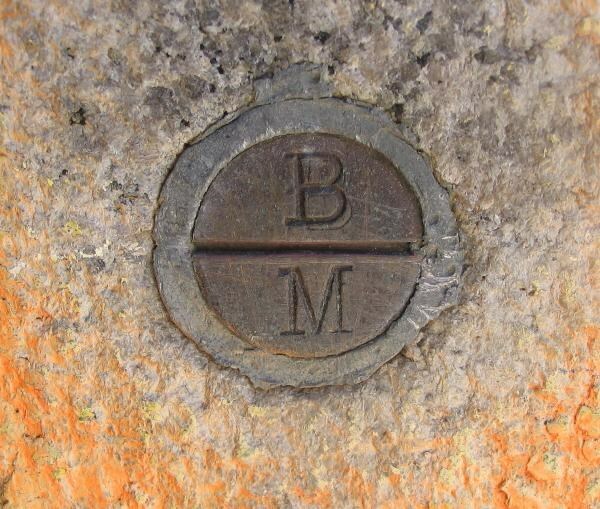 If you're planning some benchmarking for the future, please consider getting one of these marks that are nearby you. AC3351 (FL) E R Brownell and Assoc. Inc.
ME2130 (IN) Indiana Flood Control and Water Res. Comm. AA9436 (VA) Geometrics GPS, Inc.
DH3810 (WA) Foresight Surveying Inc.
HW3677 (WV) BSC Group, Inc.
AB5898 (MN) Crow Wing County? JZ0428 (OH) Baltimore and Ohio Railroad? EM1084 (US) US Army Range? GV6061 (VA) Newport News Water Works? SY3078 (WA) Washington Geodetic Survey? Can anyone tell me what type of marker this is? Since one of the professionals in the crowd hasn't answered this one, I'll take a crack at it. 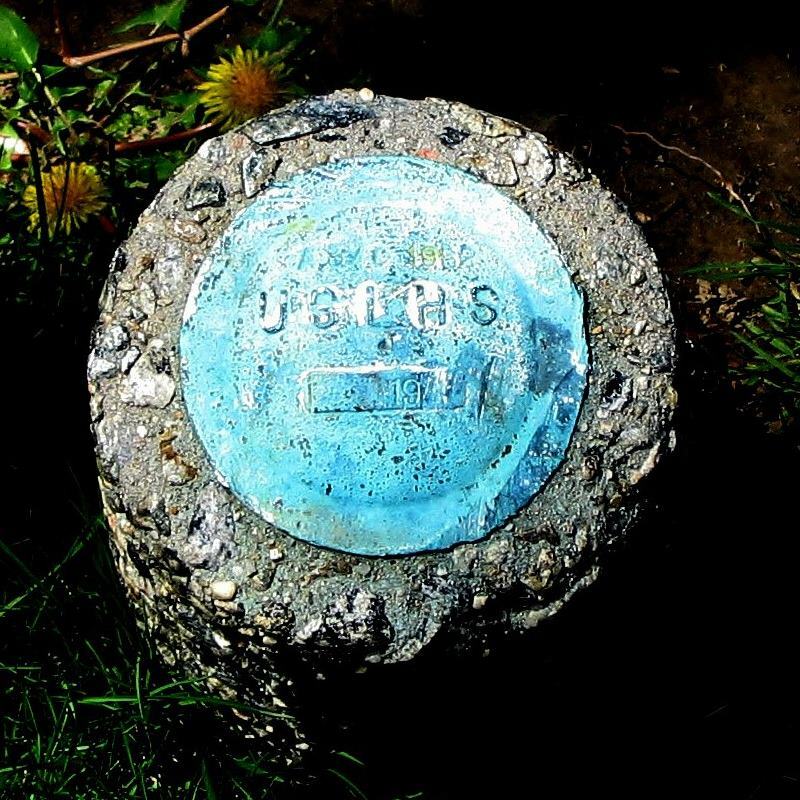 It looks like a temporary marker put down by the USGS for a local surveying project. 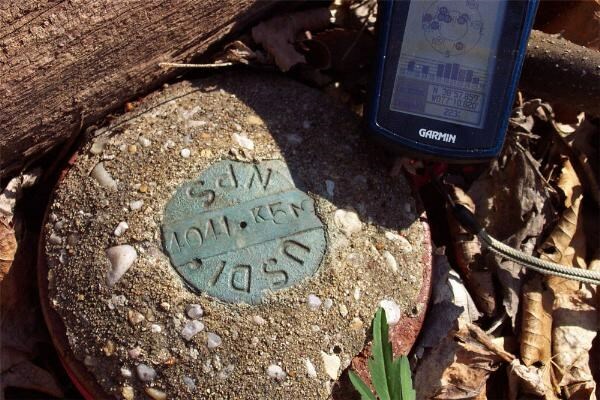 There's probably a USGS marker in the nearby area, or something that they were measuring. You're right, it doesn't have much significance to someone not associated with the USGS, or even from the team that put it down, and you won't be able to report it anywhere. 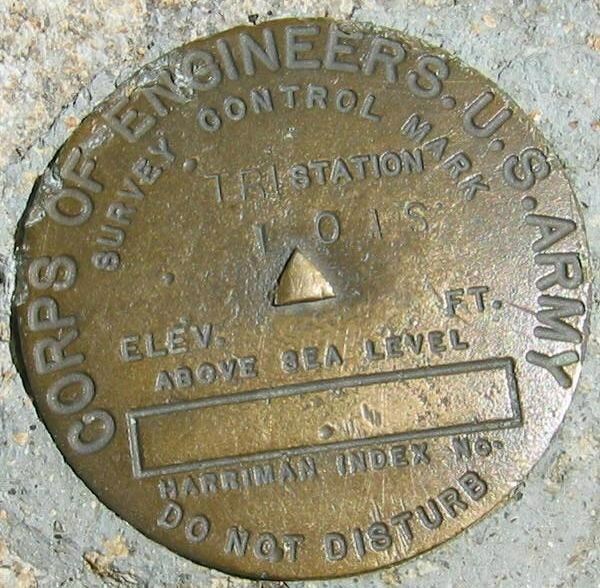 Here's one (DX5124) I found several years ago that is different than the US Corps of Engineers (US Army) ones that are on on Buckner's master Master Agency List. Anyone know what a "Harriman Index No" is? There is a box on the disc for one, but no number filled in. Disc is from 1939. Index system unique to the Corps of Engineers? Used prior to establishment of the PID system? By the way, a very nice 5+ mile hike, to a great, fully preserved (or ready for use?) Fire Lookout Station. These are now rare in this area (Southern California). So far, I have been unable to find an example of a C&GS circular gravity station (labelled 9 in the first picture). There are examples of the rest of the C&GS stations. Of the NGS disks, I have been unable to find an example of the right column middle (reference mark w/ odd arrow) and bottom (calibration station w/out cross in middle) disks. Has anyone run across these? As a relative n00b, I found this benchmark, not in the NGS database, while walking around, so I waymarked it. Are you logo indexers taking BMs that aren't in the NGS realm? Your disk (and any others that you have) is/are welcome, as a number of the disks in the list are not NGS PID stations, but their photo was logged with a nearby disk, or mistakenly instead of a nearby disk. Your disk is the first Waymarking US agency disk I've found. By contrast, most of the Canadian agency photos are from Waymarking. As a note, it's hard to make out the designation on the disk; do you have a shot that's zoomed in a bit? OY0107 (US) U.S. B.M. - Pipecap ?? KW1084 should probably be listed as a Penna Turnpike Commission disk and not a PADH disk, from the agency listed on the disk. That disk is pretty rare. I am pretty sure there are none east of that one, but didn't look west yet. At least none that are in the NGS datbase. I haven't stopped on the PA Turnpike and checked any bridge abutments to see if they have disks. KW0535 has PSDH on it and the description says Pennsylvania State Department of Highways. You're in luck - I didn't have one, but I went back to the area to see if I could finally find some caches over there, and I picked up a much better photo. From random sources, mainly the gallery. I feel somewhat inadequate with just one disk to post, but oh well. I found a new disk the other day, in Berwyn, west of Philadelphia. The setting agency is the Philadelphia Electric Company, know as PECO. The disk is smaller than most and is stampled BER (for Berwyn) P.E. CO according to the datasheet. My pic is a bit too washed out from the flash to confirm the exact stamping. It seems PECO set a number of stations in the area. There is a PECO facility just down the road, but I think the main office is in center city Phila. mloser, I added the Philadelphia Elec. Co. station. Here are a few more, from the weekend's photo gallery entries, CallawayMT's recoveries (still have to do the most recent half) and Waymarking. The way I've done variants is becoming cumbersome; I'm going to redo it slightly to compact the list. The acronym for "New York City Board of Estimate and Apportionment" is "NYBE+A". See for example KU0874 and many similar ones where they are the monumenting agency. And of course that was a note where I mention this nearby non-NGS mark. KU1296 is actually a plain old CGS disk. It's actually a duplicate, but this is a better picture. It's the same disk as you have for for the Staten Island Borough Hall (KV0422 "142 NYBE+A"). There you have "Appraisal" - it's the same agency. It's "Apportionment", not "Apraisal". I thought these were already in the list but I can't find them so I'll put them in here. If you find they are in here somewhere, perhaps with a different name, sorry. 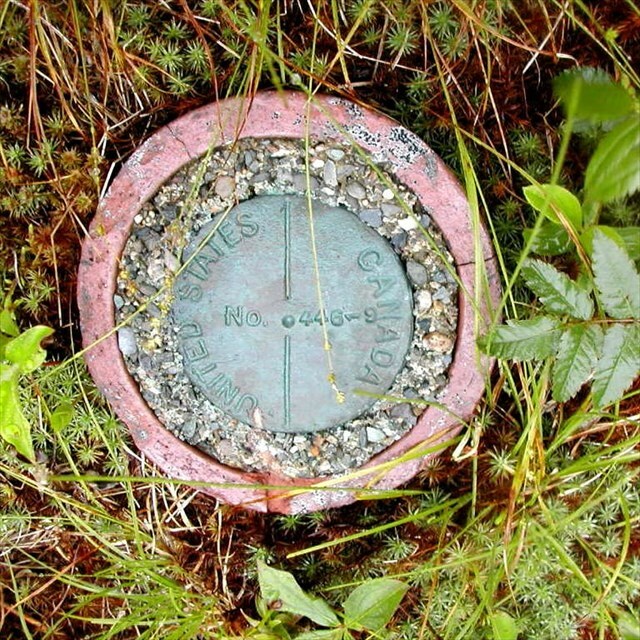 These are 4 different IBC Geodetic marks from the border between Maine and Canada. Since the IBC set their monuments at different sections of the border, I guessing there is a "local" style or perhaps it was a matter of when, not where. But these are certainly different from what you will see in the mid-west or Alaska. As for Mexico, I have no idea. These are set about every .1 miles between the monuments. I think this is similar to marks in many locales, but perhaps not with the monument number and increment number on the disk as in these. This was mounted on the base of the monument, and you will also see them on topos since the IBC provided the control for the USGS in these regions. I haven't found any of these in the NGS database, but there may be some in there. We're up to a total of 700 types of disks, +- a few. That doesn't include variants, but there are a few variants that need to be collapsed in the list, so the total should be a few less. The number of distinct agencies is probably in the high 500s. 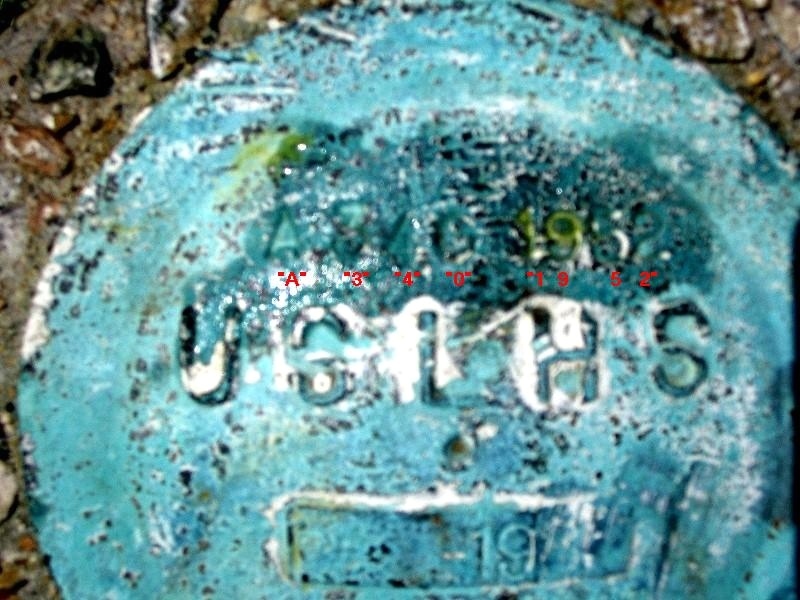 Interesting to see the last digit stamped "sideways"
I was looking over BuckBrooke's web site the other day and I noticed he had included a copper bolt from one of my recent posts set by the above agency in the city-wide survey done in 1909-1914. Having interest in these marks (I'm trying to find all that are left), I thought I would add a few items here. 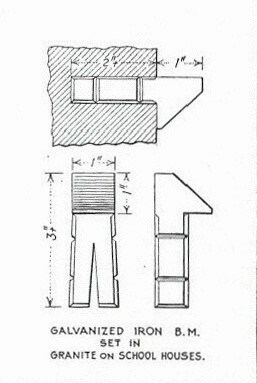 and 1 special galvanized iron bracket (see below). The information is available in great detail in the volume Precise leveling in New York City by Frederick W. Koop, published in 1914 and available in the NY Public Library. The disk has already been documented on this list (see the note for KU1296). Here is some info on the others. There ar 2 long types (3" x 7/8") and 2 short types (2" x 5/8"). 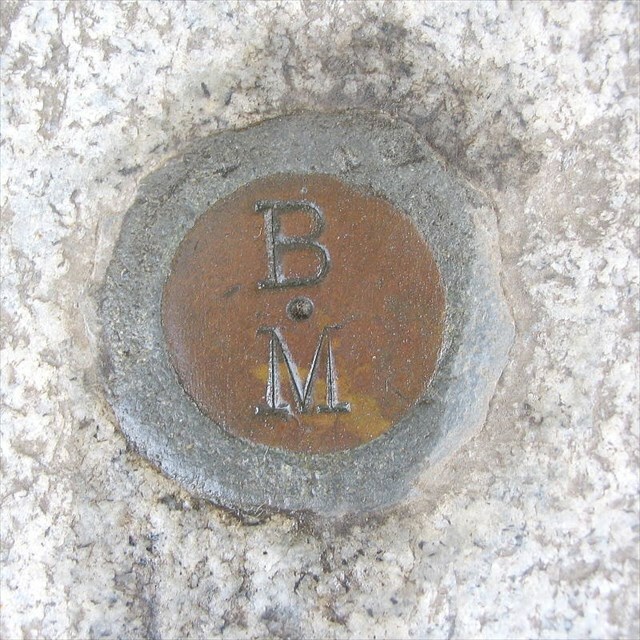 The long types have the letters "B M" embossed, and the short types do not. The ones with the horizontal bar were set in a vertical surface (as on a wall) and the bar was the actual bench mark and the ones with the dot were set on a horizontal surface (as on a step) and I suppose the pole was placed on the dot. Here are samples. Sorry about the small bolts with a dot, I have only a couple of (poor) shots of that type. 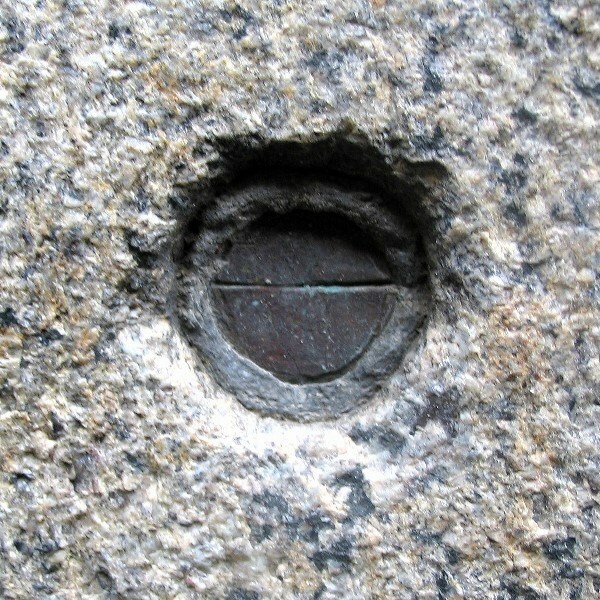 This was specifically designed by Mr. Koop and was used in the granite base of school buildings. There was almost always a chiseled mark above the bracket. The shape of the bracket is unique in that it sit on and overlaps the vertical surface and providesa a very stable base. Harry, I put yours on the list. Here's a few more from the galleries and Waymarking. I think additions to the list are starting to slow down, but it's by no means a trickle yet. WMAJC (OH) Ohio Department of Transportation - Woolpert Inc.
A fair mix in this batch; some PIDs, some waymarks and some flickr disks. Also, a good mix of national, state, local and private agencies. Here's one I found yesterday at the end of Throgs Neck in the Bronx NY. There is an old stone fort there (Fort Schuyler) and there used to be a lighthouse. 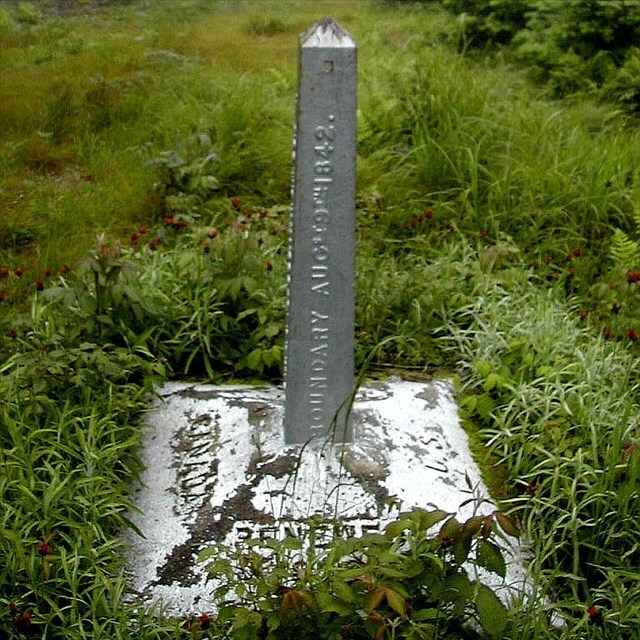 It ws one of the triangulation stations in the 1903 triangulation of Greater NY. 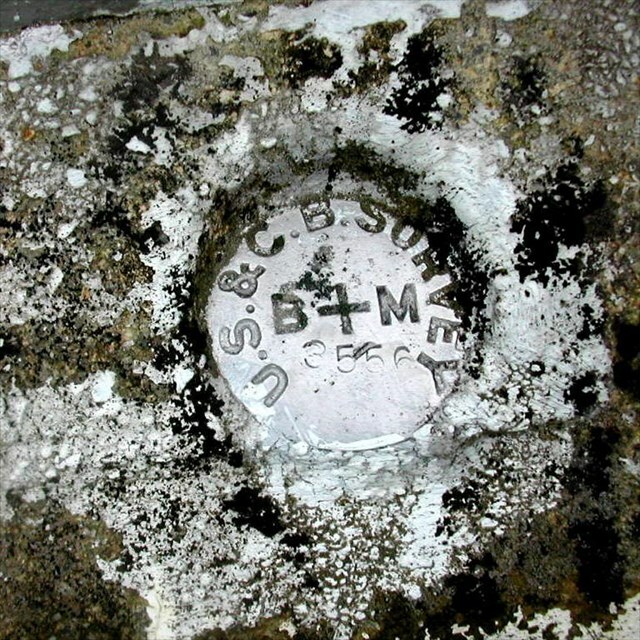 There are two marks just south of the fort, set by the USLHS (United States Light House Service). One is decapitated but the other one is intact. I don't know when they were set. I can read "193." or "194." on the disk. They were reused in 1952 by the USC&GS. The one that's intact is "A 340". Interestingly, the other one is (would have been) "Z 339". So it was the end of one level ine and the start of another at this point. I found this disk while searching for EH1385. It has the same lat/lon as the one I was looking for but does not look like the others I have found. ( Link to EH1380 that I found ) the ones I have found have the correct "Designation" stamped on them, where this one does not have the stamp T 115 like it should. I can't seem to find any info on this disk. And was wondering if any of you could help me out and tell me where I can get info on this disk? It seems to be close to the measurements described by the Coast & Geodetic survey. I have not taken a tape measure out and did exact measurements on it yet. I was just wondering if this could the benchmark, or it was replaced by this one? I think it's a random, nearby disk, not connected with EH1385. Perhaps that's a good spot for a disk. This is a US Engineer Department disk (obviously), and they don't have their disks online or in a readily accessible database, even if they have them organized. Odds are you won't find any info. It's probably associated with nearby construction, like a dam, bridge, etc. Sorry about that. 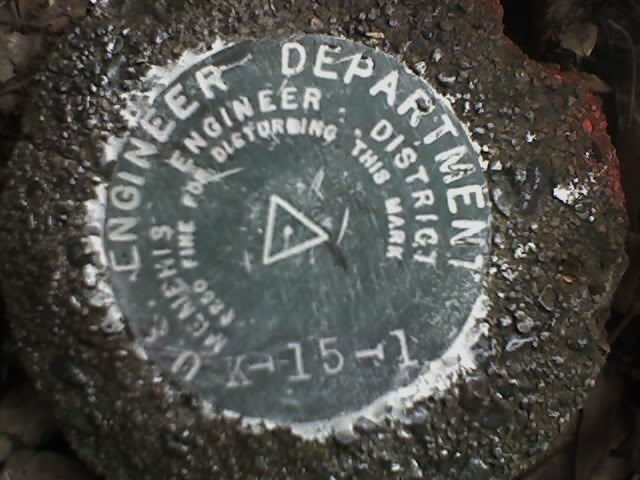 It is a new variant on the US Engineer Department disks; I haven't seen one from the Memphis office before. Thanks for the info Buck! 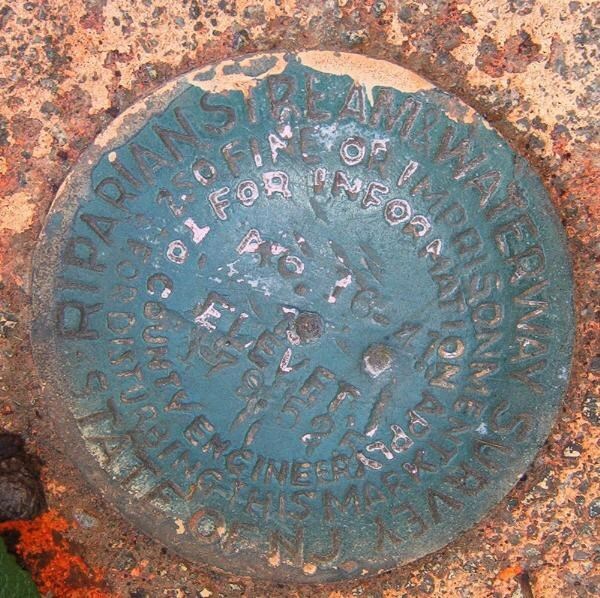 There is a bridge a few miles north of this marker. And state Hwy a few hundred yards or so north of it. So possibly it was placed here at the construction times of one of these. I am guessing it has something 2 do with the bridge construction. I worked in road construction for 10 years and have never saw a marker like this one. I have seen several benchmarks placed on older bridges. It also got me to wondering how common it is for a disk like this from one city and state to be placed in another city and state? This one is obviously from Memphis, TN and it is in a small town in AR. I found this yesterday at Fort Totten, Queens NY. The place is an old army base dating from the 19th century. KU0978 "851 6990 TIDAL 4"
This disk was surveyed as a Tidal Bench Mark in 1952, but clearly it was monumented for something else by the Corps of Engineers. I never saw a "Map Control Station" before. Has anyone seen that designation used? 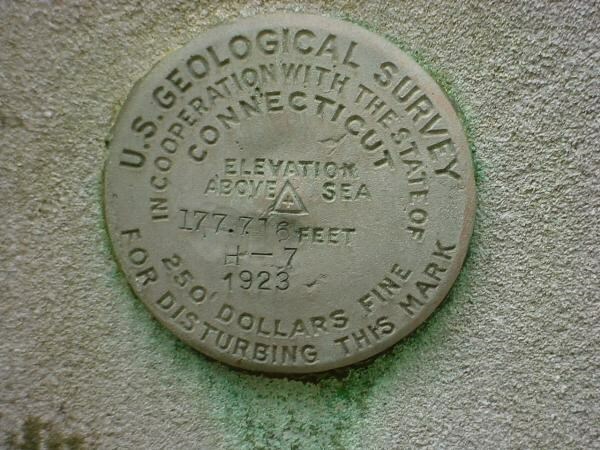 I assume it's some kind of horizontal control, but since maps also give elevation, maybe it was a bench mark for controlling a map's elevation data. 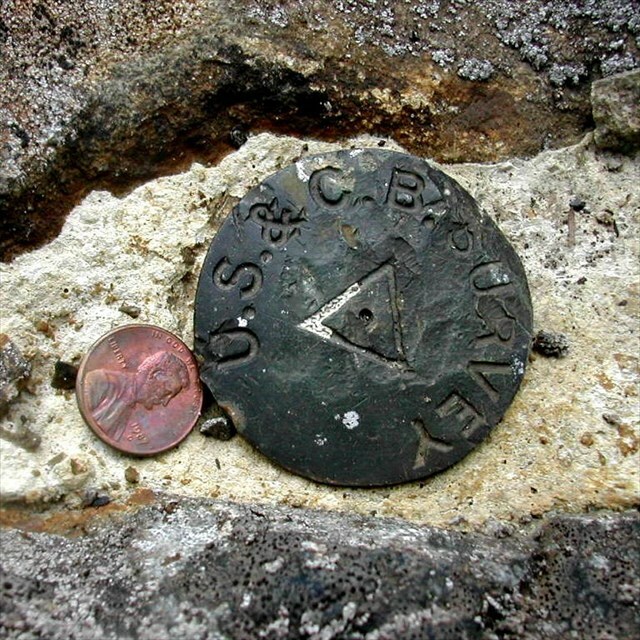 It has neither the cross usually found on a bench mark, nor the triangle used on triangulation stations. 2oldfarts asked me to include this mark to the list . It's LX0507. 1) Firefighter Skippy, you found one of the US Geological Survey "in Cooperation with the state of" series. During the Great Depression, and shortly thereafter, the USGS did many survey projects with various states. Looking through the photo logs, it seems like they usually used a generic "In cooperation with the state" mark, such as HW0004. However, folks have photographed the variants of "in cooperation with the state of" Connecticut, Hawaii, Ohio, Pennsylvania and Los Angeles County. Links are available here. Your photo is somewhat better than the current Connecticut photo; may I use it for that page? 3) Organized Chaos, the U.S. Engineer offices are regional, so that you're inside the Memphis office's district. 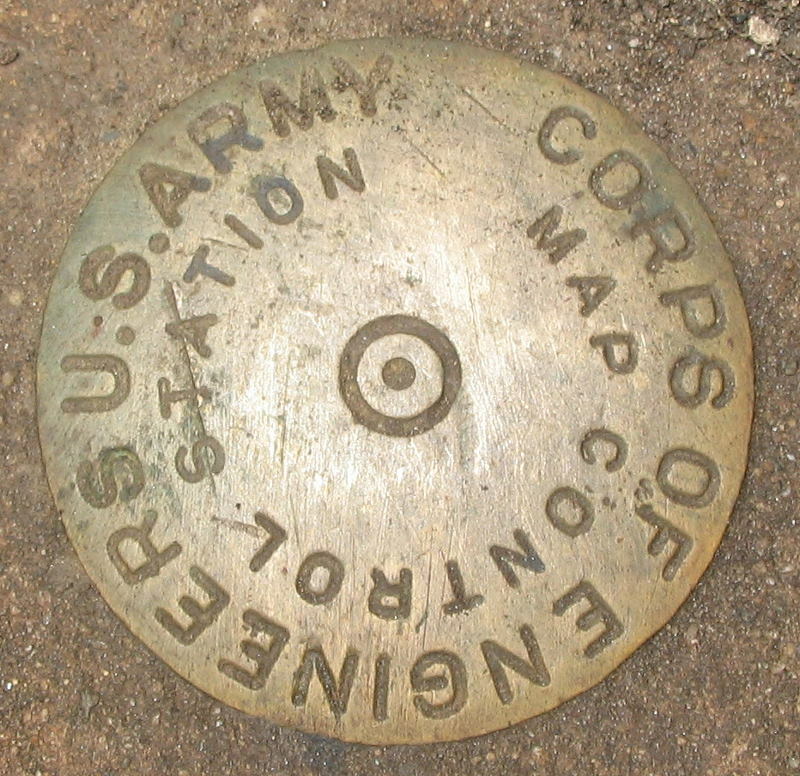 Other than the occasional cross-state boundary mark (such as those found by PFF et. al.) 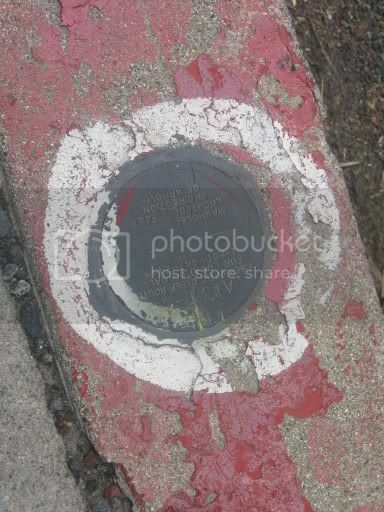 by a state surveying office, the only specifically different city/state disks I've run across photos of are the U.S. Engineer district offices. Aha. For once, I have 3 answers for three questions. Now this makes more sense since this is a tidal bench mark. I had assumed the CGS in 1952 had just used an old USE mark when they did their surevey, but now it sounds like the Army had already used it for the same purpose. As for that station in Montana, it looks like it's on a huge impoundment of the Missouri River and rather near the Fort Peck Dam, so it may be some kind of guaging station after all. Have fun with your new house. 1) Firefighter Skippy, you found one of the US Geological Survey "in Cooperation with the state of" series. states. Your photo is somewhat better than the current Connecticut photo; may I use it for that page? BTW i have added a photo for this disk. I cannot seem to link to your page. Sorry about the delays; my wife and I have bought a house and we're in the midst of moving. I've a list of new agencies picked up through the photo galleries to update; I'll include ya'lls and update soon. AT&T have been putting these Benchmarks as routes for Fiber out not listed as far as I know.